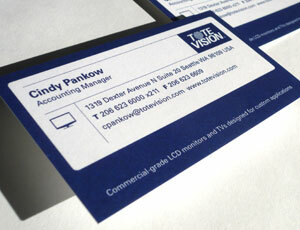 Design Hovie Studios, Inc., has designed the new business cards for Tote Vision. Seattle based Tote Vision is a leader in high end, commercial grade monitors and televisions. The new card refines Tote Vision's brand and places information in easy to read segments consistent with the company's high tech aesthetic. The entire project was a 1 month process designed in Seattle by Creative Director Hovie Hawk and designer Maxwell Churchill.